It has been reported that Justin Bieber was shopping for sunglasses in Kitchener, Ontario on the Boxing Day this year. For those who don’t know, Boxing Day in Canada is equivalent to Black Friday in USA. Ok, now about styles, we think Justin will look good on this John Galliano JG0017 – they will add more masculine touch to his pretty face. In the same time they will go well with his casual, sporty style making it more glamorous. He will look good in these Gucci shields GG 2800 – they will create cool vibe and add almost this “untouchable” feel to his appearance. Same result will be achieved in these Prada shields PS 52ES . In either case, he should be shopping online to avoid the mess with paparazzi. Eyeinform is perfect for that. I am not sure which news are more high profile – Natalie Portman getting a baby or Elton John. In either case the net is blowing off with all kind of articles and even more important – comments. Some people are judgmental to 63 year old gay Elton John and some – to yet unmarried Natalie Portman. Ok, let’s admit, we live in 21st century where everything is possible. If society welcomes equality based on sexual orientation, than it should accept equality based on gender – the right long ago accepted by North American countries making them human rights example to the rest of the world. Still with me? Ok, so, if two lesbian girls can simply just get pregnant and have a baby without any kind of paperwork and permission, why can’t guys? Isn’t it just fair that gay guy couples should have a right to have a baby? Especially guys like Elton John, a person of immense respect, one of a celebrity pioneers in charities for AIDS http://www.ejaf.org/ (raised over $15 million) and gay rights. Elton John has tried to adopt a boy from Ukraine. To his surprise AIDS affected Lev looked like a mini-me version of Elton and absolutely touched his heart to the point that Elton wanted to raise him as his own son. But laws in Ukraine became a show stopper to this endeavour. To some reports laws in Ukraine don’t allow adoption by gay couples, in reality they just don’t allow adoption without hefty bribe. Angelina Jolie had similar issues with Gleb, although she is not gay. We can’t blame these people to give up fighting with bureaucracy to literally save lives of children that fallen to their heart and woke up parenthood in them. After going through this humiliating, heartbreaking experience both Angie and Elton decided to have their natural own. 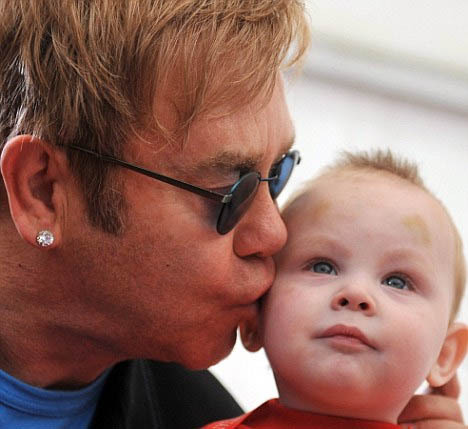 We can only wish Elton and his partner David Furnish amazing parenthood and their son Zachary memorable childhood. Natalie Portman and Charlie Tahan in Love and Other Impossible Pursuits. One of the most talented and beautiful actresses of Hollywood has announced engagement to a dancer Benjamin Millepied and that they are expecting a child. Natalie has first touched our hearts by her performance in Leon, when she was just 11. Despite a quick rising career Natalie was able to graduate from Harvard in psychology – and we all know there are no shortcuts there. Her education not only didn’t slow down her acting career, but seem to have only deepened her performances making her characters more real or surreal based on what was needed. Her role in V for Vendetta is a proof of that. She is drawn to roles that portray people from different times and societies, starting from daughter of royalty in The Other Boleyn Girl, ending with stripper at Closer. But interestingly she has been playing a mother so many times that after watching some of these movies you would become convinced that she already has a few of her own. These include Cold Mountain, Goya’s Ghosts, Love and Other Impossible Pursuits, Brothers and Where the Heart Is. She was brought up in a loving family of a doctor, never encountered any issues with drugs or alcohol. She will be a great mother and we wish her amazing family life. Since 2005 when Tom Ford announced his own brand, he launched clothing, perfume, accessory collections. His eyewear collection however made the most buzz. ability – after just few years of working at not so mainstream Ellis Perry, starting in PR, he took on the challenge to reinvent Gucci as a Creative Director – not something you’d expect from an American bred architect. Roberto Cavalli, Dior, Gucci etc are concentrating on decoration of the temple – side of the eyeglasses, Tom Ford is concentrating on the frame – front of the eyeglasses. One may think that many frames look similar, but after you imagine your face in it, you will realize how much difference a slight deviation of an angle can make. His unique factor is simplicity, just unambiguous genius simplicity. You will find every simple shape in Tom Ford sunglasses and Tom Ford eyeglasses: square, just like TF5147, rectangular just like TF5149, oval, round and even bow shape just like TF0175. In fact Tom Ford eyeglasses are the only ones that have aviator shape in prescription variant. He is the only one who has a perfect round shape in plastic material just like TF5150. I would however note, his style is not in primitivism, it’s in minimalism. Frames are made with lots of thinking about face curvatures making sure glasses fit and are comfortable. There are many bridge and eye sizes satisfied in both 2009 and 2010 collections. We only wish he would have more options for ladies and hopefully in 2011 it’s all yet to come. After numerous attempts to reboot Skype today, I realized something is terribly wrong. I installed, reinstalled new and older versions, checked firewall and Internet connection – all for nothing. I did have similar issues before, but always found a way to start Skype and do some talking. Today is different. After searching the web I found this article: http://eu.techcrunch.com/2010/12/22/skype-goes-down-and-twitter-goes-insane/ and several more along these lines. Not only Skype is down, but also Twitter – I checked at 3:10 pm EST – it was. Perhaps too many people tried to check Twitter for #skype updates, which caused Twitter crash consequently. What is in the world going on! I am sure they’ll figure it out. Is it a really big deal? I don’t think so. We lived without Skype before and there are other services such as Calliflower, Google Talk and old Windows Live Messenger. We all love Skype, everyone knows it and people like my mother in Ukraine, figured how to use it. We wish it goes back to live soon. Until then, we continue loading new frames to Eyeinform – your ultimate online source for eyeglasses. John Galliano has done something right this year, he launched a line of John Galliano sunglasses. He must have been inspired after watching Dior line sell so well. There are plenty of choices for ladies and for men which is just fair. 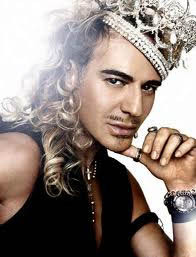 When popular labels such as Roberto Cavalli have completely dropped men line and Bvgari, Tiffany have extremely scarce selection, John Galliano went all in for men. You will find both plastic and metal material, many shape types from aviators to rectangular and wide variety of colors in each model. There is also a great price range going from low $300s to $700 retail. But right after mentioning the price we must mention the quality. With his eyewear debut Johny showed he is serious about glasses business because quality is superb. Each frame shows lots of hand work in layering various materials, exquisite lens shapes and even color mixes. Galliano frames are true designer items. No frame is trivial or cheap looking. and you will know what I am talking about. JG0010 is a signature piece – must have for boldest fashioniastas. Galliano has showed some character. He is superstitious as there is no model #13 in this collection. Many frames made it to our collection of clubbing sunglasses. Thank you John for taking a part in eyewear business and for creating such an amazing line of sunglasses. We wish you all the best and are waiting for prescription frame designs in the upcoming year. As 2010 is coming to an end we would like to conclude with overview of the new trends that could be observed in eyewear fashion throughout the year. It is evident that eyeglasses, especially sunglasses were getting bigger and rounder just like this Dior’s Myladydior. We can say with confidence that round shape has the largest count in our current sunglass collection. What we used to call “classical” was definitely going away throughout the year. Guccis, Diors, Cavallis and Pradas while trying to relate to their signature shapes were much more experimental this year. This applies to both color and shape particularly in ophthalmic just like this Gucci 2883. We saw much more red, purple and white. Some companies were experimenting with material introducing leather, jeans and coloured decorative stone to the frames or simply combining metal with plastic in one frame. 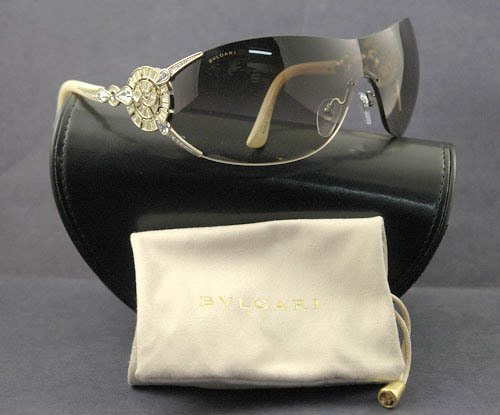 Almost every brand we sell had at least few shield models just like this Bvlgari BV6029B. Without question shield is popular for both practical and aesthetic reasons. Because shield frames are mounted on metal carcass along with adjustable nose pads, it makes frame much more flexible and friendly to many face shapes and bridge sizes. Shield shape also wraps around the face providing for more sun coverage on the sides. These best sellers also look stunning! Interesting observation our staff had is that currently among newest models (2011) there is no gold frame shield frames. There is really no explanation to this, but it’s the fact – you won’t find a gold shield frame today. Ugly Betty frame types gained popularity in 2009 that reached the peak in the middle of 2010. Retro nerd vintage look spectacles now come in huge variety making at least 15% of each ophthalmic collection. Prime example would be this Prada PR 01NV. Although we note, this is a diminishing trend in 2011 among younger people, but adults are just now starting to catch up. This year our beloved brand names are especially creative with designs that are suitable for parties. Generally we see the clear trend in frames, even those for every day, work wear that they are much more decorated than before. You see more rhinestones, color and material combination on one frame. Companies are getting very creative and over the past year we saw new materials present in a frame that appeared impractical for the first glace but ended up to be good sellers. I am talking about such materials as pure wood, leather or even cotton jeans. This plastic prescription Gucci frame has combination material temple made quite interestingly. While still having a Gucci signature logo pattern it also has two rows of rhinestones that make it very dressy. This frame comes in a variety of colors (black, red and two types of brown) and should satisfy any taste. Bvlgari, a famous jewellery maker, has created this metal prescription frame to serve you as a jewellery item while still carry the function of eyeglasses. Big crystals stand out beautifully creating especially posh and high end feel. Combination of plastic and metal on the temple visually weight out the heavy crystal adding elegance to this frame. 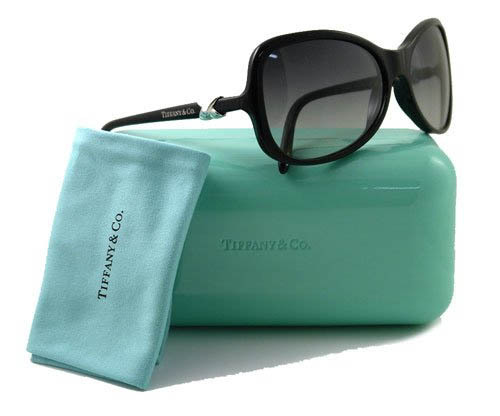 This elaborate Tiffany prescription frame does truly look like a jewellery item. Large rhinestone sun shaped buckle on the temple is a signature item in the 2010 collection. Frame comes in beautiful pink and brown in addition to black. When wearing this frame you no longer need to worry about earrings – frame will work for two. ar, Prada created this frame to give you an option of dressed up eyewear. Plastic frame comes in a beautiful red, purple, brown, tortoise and black. Row of rhinestones on a unobtrusive metal belt makes this frame very elegant and dressy – will be perfect if you want to look festive but without making a loud statement. Cavalli is a leader festive eyewear maker. Every frame has design of incredible beauty. 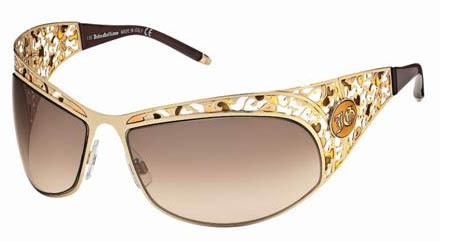 When some people are referring to term “designer eyewear”, they probably thinking of Roberto Cavalli glasses. We picked this frame for this article because it is an example of a rimless frame that is very decorated and dressed up. Metal flowers with rhinestone middle will add that festivity you are looking for while providing for a light frame to open the face. This is a true classic to enjoy. Please browse Eyeinform – your ultimate eyewear online store, for more styles to pick your perfect pair of glasses for the holiday season. With holiday times coming up in a few weeks the gift buying season is reaching its peak. Over the economy downturn gift buying patterns among general population have shifted towards practical. Glasses or sunglasses are now perceived as a good Christmas gift like never before. Ask yourself “What does my beloved one like to do? Does the person enjoy any sport? Does it like going out? Does it drive a lot? “. The answer may lead you to an idea. If the person enjoys skiing, this Gucci Ski Goggle will make an excellent gift. It will fit practically any face shape and size and comes in two colors – black and white. Getting this Gucci authentic ski glasses will make long-lasting impression. Hey, you can’t even get a pair of socks from Gucci for this price. You spend only $150 and get a gift that worth all $300. If you are planning to go away to Caribbean for the Holiday Season or soon afterwards a pair of good sunglasses will be “just in time” kind of gift. Choose among trendy brands and create a high end label surprise. If your beloved one loves clubbing, check EyeInform’s list of suggestions for clubbing glasses. Clubbing glasses is a current trend; they make a great fashion statement while being quite functional. They have 100% UV protection and can be worn during the night driving or just dark days – and this winter promises many of those. Clubbing shades will satisfy any fashionista whether it’s a girl or a guy. Agree, a pair of glasses or sunglasses is a far better gift than a pair of shoes, sweater or a shirt. Not even mentioning that the latter will cost you at least as much if not more than a pair of brand name glasses. This is just how this industry works. You might have noticed that exclusive brands such as Bvgari, Gucci, Dior and such sell simple clothing items for the price of a full blown pair of sunglasses. And remember, EyeInform only carries authentic products. Each pair of glasses comes in original case, cleaning cloth and authenticity certificate inclusive. If you are considering buying jewellery for a gift, look no further. Fancy looking glasses from most renown jewellery makers Tiffany and Bvgari will make your lady cry tears of joy as she puts them on the first time. Both companies sustain its class in eyewear products by using silver, rhinestones and even diamonds as a part of decoration. 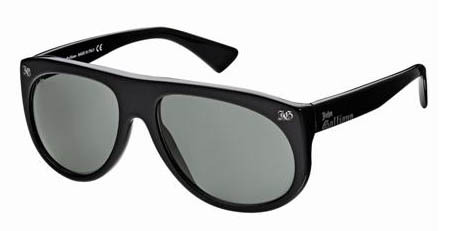 Their design style is also very well sustained with signature logos and trademark engravings used in each frame. With final few weeks before holidays some of my friends have a party to attend 3-4 times a week. Of course even very infrequent celebrators most likely go to a club or lounge type venue to celebrate. Would you like to look AMAZING this season? Here is a tip for you – get a pair of clubbing sunglasses. It is sunglasses with light colour lens, often gradient colour that were styled to compliment your night celebration style. Since the idea is not really to protect you from the sun, these often come with a lens of some bright color such as yellow, pink, blue, purple etc. Well, there are lots of fun factors. One would be the look. You may not have had time to put on a fancy makeup, especially given the busy work schedule in the end of year. These shades will hide your imperfections. When you wear such a beautiful accessory you can devote less attention to clothing. Clubbing shades will attract so much attention that what you wear will be less of a factor. Do they have UV protection? Yes. High quality clubbing shades, and we only sell those in EyeInform store, do have 100% UV protection. You absolutely can wear them to protect your eyes from the sun. You will find them much more comfortable during sunset or during the non-shiny days as compared to your full blown dark sunglasses. Sun may not be shining bright, but it still produces UV harmful to your eyes and skin, so these glasses will be an amazing alternative.